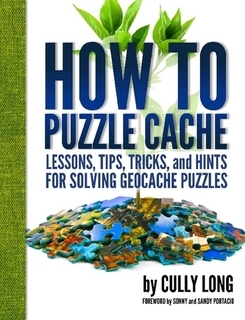 How To Puzzle Cache is a new book (officially released December 13th, 2014) by a Geocacher named Cully Long, AKA childofatom on Geocaching.com. You can click the banner above to go to the website he has created for this 302 page book for more information, including sample pages and ordering information. We at OCNA first heard from Cully in way back in November, 2012, when he was looking for some information about our listing site to include in the appendix for the book. We asked him if he would like to be interviewed by our blog, and even fast track it before the end of 2014. He was happy to sit down and answer some questions for us. OCNA: Our obligatory first question, where are you from, when did youstart Geocaching, and how did you first hear about it? Cully: I still consider Savannah, GA home even though I have lived in New York City for over a decade now. I started caching in 2006. I honestly can’t recall where I heard about it, but I’m pretty sure it was a magazine story. At the time I didn’t have a GPS so I didn’t actually start caching immediately. A while later I was working in a very rural area, there wasn’t much to do, and I remembered caching. I had just won $100 in a poker game, so I went to Wal-Mart, picked up a GPS and did my first cache that week. Over the summer I cleaned out that area, and have been caching ever since. OCNA: Is there an interesting story behind the handle childofatom? Cully: It’s been my online identity since there was such a thing as online identities. I chose that name in 1998 when I joined AOL for the first time! It’s a riff on a nickname for the X-Men, the “Children of the atom,” because their mutations were supposedly kick started by nuclear testing and radiation. OCNA: A lot of people are highly intimidated by Geocaching puzzles, or just plain don’t like them. Is there anything special in your background before Geocaching that helped you become good at them both on the solving and creating side? puzzles could be an aspect of caching I was thrilled! OCNA: You’ve found over 200 “?” caches, and created over 25 (that doesn’t necessarily mean every single one of them was a puzzle, but most are). Which do you enjoy more, solving them, or creating them? Cully: Well, they both have their good points. Having that “A-ha moment” is one of the best feelings in caching! But working in a creative field does draw me to the creation side. Creating something that will bring joy to other people (hopefully) is also a great reward. Creating a good puzzle cache taps a lot of resources: storytelling, image creation, container creation, location scouting… it’s a lot of fun. I don’t know! Choosing between solving and hiding is like asking me to choose between chocolate and cheese! They are both too good to live without. OCNA: Can you tell us more about the “gate series” of puzzle caches you created in Central Park in New York City? Cully: Central Park is completely surrounded by a stone wall, and 20 of the “gates” (really just breaks in the wall) are named after occupations that were common in the city at the time the park was created in the 1860’s: merchant, artist, scholar, farmer, pioneer, etc. I created the first one (Stranger’s gate, which is named for immigrants) before I even knew there was going to be a series. I was just attracted to the weird name. A few months later I created a new puzzle and when I realized it was close to the Scholars Gate a series was born. Currently 19 of the 20 gates have puzzles associated with them. I’ve tried to make the puzzles correlate to the occupation of the gate in some way, which has been interesting. It means that some gates are very simple for the people who work in that field, while they struggle with others. Now that I’ve finished the book, which has sucked up all my puzzle writing for the past two years, it’s time to release “Hunter’s Gate” which is the finale. I’ve been saving it because of the name, hunters? Geocachers! It’s too perfect. OCNA: Regarding the book, how long did it take to complete from start to finish? Cully: I started writing in the spring of 2013. The first draft was finished about a year later, but then I went through a pretty rigorous review process. I had several cachers read the text and offer their comments. That resulted in some rewriting, and editing. I also had a couple muggles read it, just to be certain that the text was approachable and understandable. This book also had a review that few other books would need. Because it contains 30 full scale puzzles and several dozen partial puzzles, as well as coded text and other examples, I had several puzzle cachers solve them, to verify that they worked as intended, and were of a difficulty that is appropriate for a text book. All of that took another 9 months, so all told, it has been close to 2 years. OCNA: We notice you went the self published route with the book, and are selling it on lulu.com. Did you consider any other choices? And why did you ultimately choose lulu? Cully: Geocaching itself is a niche market, and puzzle caching is a niche of a niche, so I doubted that a full scale publisher would be interested. Self publishing also allows me a greater freedom on content and style. Lulu is an amazing service that does what is known as “print on demand.” This means that until someone orders the book, it doesn’t actually exist, each one is created to fill the order. The up side is that there is no minimum print run, no warehouse full of books that someone is trying to sell, and no extra copies sitting in my closet. Lulu also handles all the distribution and mailing, another weight off my shoulders. I also knew from experience that they used a high quality paper, and created an over all good product. OCNA: Any plans for an E-book version in the future? Cully: Honestly, I’m not sure. I’ll go where demand dictates. There are over 500 photos and illustrations in the book, which will make conversion to digital much trickier than a standard novel or text. Plus a large portion of the book functions as a reference book, with code charts and other other solving aids. A digital book lessens the usefulness of some of that material simply because it is much more difficult to move between pages, or look something up in an index and then quickly get to the correct page. OCNA: There is standard paperback edition of the book, as well as a spiral bound edition. Why is that? Cully: I view this as a textbook of sorts, and it is packed with informational charts and other material. To make that useful I thought a spiral edition that would lay flat would be the easiest. However, I knew that some people wouldn’t want that, so I also offered the paperback. A few months into the creation of the book I also discovered that I could only have an ISBN assigned to a paperback version, and the ISBN opened me up to distribution channels outside Lulu, so that edition became more important. Plus, choice is always good, right? OCNA: How are you promoting the book? 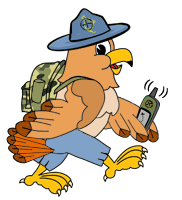 Do you have any plans to hit the regional Geocaching Mega event scene as a vendor? Cully: Right now I am working entirely off of word of mouth, and promotion within the geocaching specific press, Podcacher, Geogearheads, geocaching blogs. I’ve also been very active on Facebook, building a community at the page for the book, as well as posting notices on various regional Facebook pages, where the administrators have allowed me. As for Megas, I’ve already been approached by a few smaller events to present, so hopefully that trend will also extend to Megas. I think you can expect to see me at a few, especially in the NE region. OCNA: Are you pretty confident you at least touched on all the types of Geocaching puzzles out there? Cully: Oh, no! I actually don’t make that claim. Even if I had focused just on ciphers it would have taken a book several times the size of this one to cover every possible cipher in the geocaching world. The goal of the book is to introduce people to some of the most common puzzle types, and give some hints for others, to help readers begin to build a toolbox for solving. Puzzle solving is like anything else, the more you solve the more you learn how to solve, but if you are intimidated by even the basic stuff you will never even begin growing that bank of knowledge. As a puzzle CO I have often been shocked by people asking me about even the most basic puzzle cache techniques, like waypoint projection and Caesar Ciphers. If you can’t approach a cache that requires a simple projection, how could anyone ask you to solve… an Enigma code cache, or something involving steganography? After reading my book I would hope that cachers have a language that would allow them to at least approach the puzzles that I didn’t directly mention. OCNA: There are a lot of online links referenced in the book. You have plans to put them all in one place on your website in the future? Cully: That page is certainly planned! My hope is that the webpage and the Facebook page will act as an extension of the book where information like that can get posted, as well as new resources that I discover during my own puzzle solving efforts, which are of course ongoing. I will also be posting some practice puzzles on the Facebook page, not necessarily geocaching specific puzzles, but good practice nonetheless. OCNA: Each chapter of the book ends with two puzzles. Since there are no real caches at these coords, can we expect to find anything there? Cully: I know that cachers are accustomed to making finds at the end of their puzzle solving, so I tried to replicate that as much as I could on the page. Each set of coordinates in the book, (with a few exceptions) whether they are answer to one of the puzzles at the end of the chapters, or just coordinates used as an example point to something interesting in the real world. For instance one of the example puzzles uses presidential portraits, and the answer points to the lawn of a presidential library. That was another aspect of the book that took quite a bit of research. I spent a LOT of time looking at aerial photos and satellite images. OCNA: Anyone who clicks on the link to your books page on lulu will see that it is not the first self published book by Cully. Can you tell us a little bit about your other book? Cully: Thanks for asking! Besides geocaching one of my hobbies is sketching. One of my favorite places to sketch is on the subway while commuting, usually portraits of my fellow riders. It’s a great way to keep my skills sharpened. A few years ago I published a collection of 100 of the best of those. If you are curious about what else I get up to when I’m not caching, have a look at that book as well!